...In more than half of the largest metropolitan areas, urban core communities have dramatically increased their share of new residential building permits. * The central city has more than doubled its share in 15 regions (of 50 studied). * The increase has been particularly dramatic over the past 5 years. * Data from 2007 show the trend continuing in the wake of the real estate market downturn. Cincinnati Parks offers some great summer daycamps. We have tried a few of them and highly reccomend them. They are a great bargain at about $50 a week. Some of them fill up so even though summer seems far away, you may want to register now. A couple of notes about projects at two different portions of the Mill Creek. I have hiked around both of these areas, and restoration, especially at the area around Caldwell Park will offer a respite in a dense industrial waterway. I am so excited that someone is actually trying to salvage the Mill Creek. ...Mill Creek Restoration Project (MCRP) completed work on a major streambank and floodplain restoration program designed to protect Mill Creek water quality and aquatic habitat and to improve ecological conditions in the southwest corner of Caldwell Park. The recreational park is owned by the City of Cincinnati and located in the Carthage neighborhood. ... included stabilization of 340 linear feet of eroding streambanks and restoration of the adjacent floodplain, located immediately upstream of the North Bend Road bridge over Mill Creek. 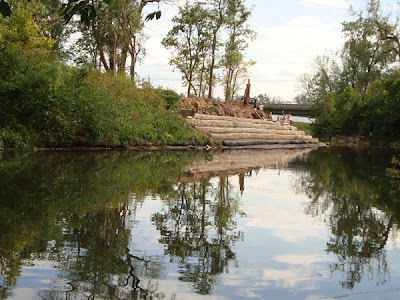 Prior to the project, site conditions included a degraded floodplain due to other construction activity, and fifteen-feet high, severely eroding streambanks that have caused continued loss of park property and trees. The bank erosion also caused increased sediment loads to the stream, impairing water quality and adversely impacting aquatic life. ...Soil bioengineering is a highly effective method for restoring streambanks and achieving other ecological objectives, including improved wildlife habitat, enhanced aesthetics, and increased shade along the creek. The approach is based on sound engineering, hydrology and ecology, and employs vegetation with good root systems to stabilize the slopes and soils. ... MCRP and its partners contributed $14,780 in inkind services and materials, including fieldwork labor by 54 students and teachers from Clark Montessori, a Cincinnati Public School. Other invaluable Clean Ohio partners for this project include the Cincinnati Park Board and the City Recreation Commission. The Greater Cincinnati Foundation (GCF) has awarded a $35,000 grant to Mill Creek Restoration Project (MCRP) to underwrite planning and design costs for the first phase of the City of Cincinnati's Queen City-South Mill Creek Greenway Trail. MCRP is especially honored that a portion of the GCF grant comes from the Joan Jones Portman Nature Enrichment Field of Interest Fund, because of Mrs. Portman's inspiring dedication to the conservation of natural resources. When all three phases are complete, the off-road Queen City-South Mill Creek hike and bike trail will span 3.4 miles along the river, from Mitchell Avenue at the Queen City shopping center to the Mill Creek Road bridge in South Cumminsville. The multi-purpose trail (e.g., for recreation, exercise and bike commutes) will connect with existing streets, on-road bike lanes, Metro and Access bus stops, and pedestrian sidewalks. 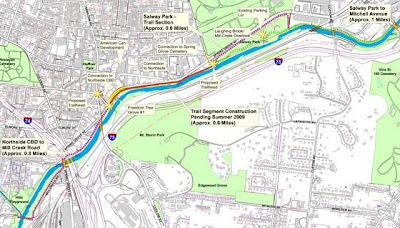 In addition, the trail will link parts of five residential neighborhoods; two business districts; Salway park, a heavily used recreational facility; and the Spring Grove Cemetery together. ...the project will help to regenerate natural resources, including restoring wildlife habitat by planting Ohio native trees. Signage and art will be integrated to highlight the rich cultural history of the Underground Railroad that actively operated along Mill Creek. ...MCRP will offer environmental education and service learning opportunities for thousands of sixth through twelfth grade students. ...Although it seems counterintuitive, officials believe the move will actually improve the overall flow of traffic, because the diagonal path of Broadway tends to disrupt traffic where it intersects with other streets. 10 minute clip is on YouTube. As the suburbs continue to be overbuilt, housing prices decline in many suburban communities. As the prices get low enough, they begin to attract more and more poor people, who previously only lived in the city, near services and transportation. ....In 2005...suburban poverty, in raw numbers, topped urban poverty for the first time. ... "Suburbia is overbuilt and yet we will keep on building there. Most policymakers don't see the consequences, and those who do are denying reality." Miami real estate broker... said he's witnessing the spiral, even within newer tract-home development ... many early middle-class buyers in these transition neighborhoods are desperate to sell but can't. .... Most of the homes he expects to exist in 2025 have yet to be built. He said planners can reduce that oversupply by crafting long-term growth policies that reflect a careful assessment of regional demands ....What they will find, he said, is a preference among all income groups for denser, mixed-use communities with access to mass transit. Some people are so set on living a life in which they can drive door to door, so against ever getting out and actually walking places or riding in public transit that they go through all kinds of contortions to make their drive-thru lifestyle sustainable. They are like Sisyphus pushing that rock up a hill. WILMINGTON - Clinton County...is throwing its support behind the MonoMobile. 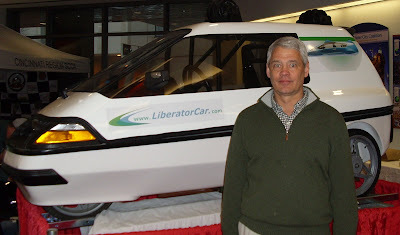 ...The startup MonoMobile Corp., created by real estate investor Jay Andress of Hyde Park and Andy Webster of Indian Hill, hopes to hear this spring whether it will receive a $2.8 million matching grant from Ohio's Third Frontier program to build a mile-long test track to refine the project. ... an electric-powered personal vehicle that could travel about 50 miles between charges for local travel, but would hook up to an electric-charging monorail built along interstate rights-of-way for high-speed, long-distance travel. 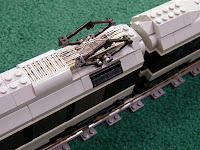 ... it allows the driver to travel short distances and if the person wants to go to the outskirts of the city or to another city then using the wheels attached to the roof it connects to the monorail. ...The developers spent a sum of $2500 preparing the CityEl, now dubbed as the Liberator Car. They are also planning an additional $10 million for a 1 mile test section of monorail. The new Liberator Car assures that the driver will never have to worry about running out of power the moment he reaches the destination..
- the car is too small for families, too fragile for road travel. - three wheeled vehicles are inherently unstable. - no one wants to go 200mph in what is basically a bicycle with a fiberglass shell. - the design is proprietary and thus limited in scope. - lifting a transport system off the ground makes it prohibitively expensive. - they've spent only $2,500 on it themselves, but want $2.8 million from the State? Look, long distance, fast, electric transport is done all the time in other countries. It is called electric rail, and it is tested, safe and we already have the right of ways. The only problem is that you must detach yourself from a car to use it. For some people this is a step too far. Is Dayton really the fifth emptiest city in the country? I hate these kind of stories, as they surely mean demolition of buildings and wasted infrastructure. Las Vegas, Detroit, Atlanta, Greesboro NC are 1-4. Interesting article about aging in Portland. One trend is called "aging in place", which means living in a home and neighborhood that can support people of all ages and abilities. ....Last year, AARP The Magazine named Portland one of the top five places to live and retire (along with Atlanta; Boston; Milwaukee; and Chandler, Arizona), based, among other things, on our cutting-edge urban-planning philosophy, our large number of mixed-use developments, and our accessible public transportation. In 2006, Portland was the only American city to participate in the World Health Organization’s (WHO) Age-Friendly Cities Project, a global study that identified solid indicators of an age-friendly city—everything from creating green spaces to offering priority seating for elderly passengers on public transportation and ensuring “psychological safety” in urban environments. We volunteered to do the weekly milk pickup for our herdshare, and met our herd. It was a good trip, and I am still absorbing the implications. If you are interested in a herdshare, Cincy Locavore has some good info. The International Dark-Sky Association has just completed a long process in which they have written a model ordinance that can be adopted by local jurisdictions to limit harmful light tresspass, glare etc. They are accepting comments and criticism for the next months, and will have a final document later this year. Read about it here. Interesting interview here with Chris Leinberger. 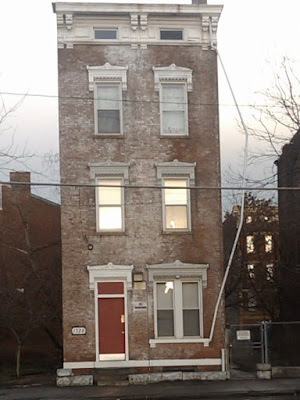 I was thinking about changing the "what this blog is about statement" to reflect more what it has become, which is a blog about old buildings, urbanism, and stuff like that. My original intention here was to organize get-togethers for downtown families. But that never really happened, and I think that kind of thing would maybe work better on Facebook anyway. So I was thinking about starting a group on Facebook for downtown Cincinnati parents. After spending some time on Facebook, my only hesitation with this is that I don't think their "groups" function works so good. Maybe it works great, and the fault is with me, but it seems like it is better to just invent a person named Mr Downtown Parents or Mr Citykin or even use my real name and then make friends, and update the status often. Mostly what I get from Facebook are the status updates. Groups don't have status updates. Am I misunderstanding how this works? The other option is to start a Citykin fan page. But that even seems less connective. Anyone have any ideas on this? One direction would be that the Facebook group could be much smaller than the blog readership, and would mostly include families in the basin and surrounding hills who want to share info on things to do and plan meet-ups. This would need to be somewhat collaborative. If I am the sole organizer, it won't go far. Either way, this blog would remain as is. Follow this link to an amazing photo of the Piarist Church of Maria Treu, in Vienna, Austria. It takes you to a 360 degree GIGApixel image with rotate, and zoom controls. Pretty amazing. ...It’s important to understand, however, that we’re not talking about real assets that vanished. The houses are still there, and they’re still as good or bad or useful or non-useful as they ever were. What’s vanished is a speculative mania, and public policy can’t—and shouldn’t—create a new one. ...that is, if you want to consume at current rates and not devastate the environment and/or the economy. This blogger supports nuclear power and urban living as a green solution that could make America energy self sufficient. Biofuels, solar and wind's numbers don't add up, and the current path of coal and oil is destructive on many levels. ...Obama's $787-billion stimulus package will be steering us down the path California took in the 1980s and 1990s, leading up to the great California Electrical Shortage of 2000.....There is not one penny in the bill for the one form of energy that might give this country a future --nuclear power. ...windmills are producing almost no useful electricity and will become a huge drag on the economy -- just as biofuels have done nothing to reduce our dependence on foreign oil and have just led to hundreds of millions in wasted investments. ...it's nice to watch those 45-story structures going round and round but don't count on them to produce any useful electricity. These windmills, located along mountaintops in West Virginia, were not moving much when I saw them last fall. "I don't trust a man who makes toys in a land where children are forbidden." The Enquirer reports that the Consumer Product Safety Improvement Act will force libraries to either test their children's book collections for lead, or destroy them. Testing can cost $300-$600 per book, and Hamilton County's library system has 1.2 million children's books. Neither choice is really an option for cash-strapped libraries, so the only remaining compliance path would be to simply ban children under 12 from entering. The Consumer Product Safety Commission notes (pg 4) that they are "not aware of a single documented case" of an ordinary children's book printed after 1985 having a dangerous amount of lead. CPSC has told libraries that they will delay enforcement for a year while they try to make some kind of sense out of the new rules. Our society stands to suffer much greater harm from the ban than the scare. Imagine an entire generation of kids forbidden from discovering the magic of books and the dizzying opportunities offered by libraries. It's too stupid to contemplate. One snide commenter on the Enquirer story said, "let's just outlaw children under 12, that way Congress could solve all of our problems with one simple law." Apparently, that's the plan. No wonder Congress' approval ratings are approaching single digits. What’s the right spatial fix for the economy today, and how do we achieve it? If anything, our government policies should encourage renting, not buying. Homeownership occupies a central place in the American Dream primarily because decades of policy have put it there.... homeowners are no happier than renters, nor do they report lower levels of stress or higher levels of self-esteem. As homeownership rates have risen, our society has become less nimble: in the 1950s and 1960s, Americans were nearly twice as likely to move in a given year as they are today. Last year fewer Americans moved, as a percentage of the population, than in any year since the Census Bureau started tracking address changes, in the late 1940s. ...the biofuel boom is doing exactly the opposite of what its proponents intended: it's dramatically accelerating global warming, imperiling the planet in the name of saving it. Corn ethanol, always environmentally suspect, turns out to be environmentally disastrous. Even cellulosic ethanol made from switchgrass, which has been promoted by eco-activists and eco-investors as well as by President Bush as the fuel of the future, looks less green than oil-derived gasoline. Biofuels do slightly reduce dependence on imported oil, and the ethanol boom has created rural jobs while enriching some farmers and agribusinesses. But the basic problem with most biofuels is amazingly simple...: using land to grow fuel leads to the destruction of forests, wetlands and grasslands that store enormous amounts of carbon. Enviro initiatives often have these perverse effects. I remember the protests against the Moscow nuclear power plant in the 70s and 80s. The result is a coal burner and more strip mining in Kentucky. But jobs in Harlan County were a talking point by enviros then. ...powering the average U.S. automobile for one year on ethanol (blended with gasoline) derived from corn would require 11 acres of farmland, the same space needed to grow a year's supply of food for seven people. Adding up the energy costs of corn production and its conversion into ethanol, 131,000 BTUs are needed to make one gallon of ethanol. One gallon of ethanol has an energy value of only 77,000 BTUS. Thus, 70 percent more energy is required to produce ethanol than the energy that actually is in it. Every time you make one gallon of ethanol, there is a net energy loss of 54,000 BTUs. **Clarification. What I am referring to is the attempt to "save the planet" and through purchases of more energy efficient stuff. However, green choices can come naturally while making everyday decisions. If it pleasant, healthy and cheaper, then maybe it is also green. For example having the choice of walking, lowering heating bills, kids learning about composting, old buildings, reusable items, buying local produce etc... those are the green initiatives I can support. We have invited musicians from around the world to audition for the YouTube Symphony Orchestra. The video entries will be combined into the first ever collaborative virtual performance, and the world will select the best to perform at New York City's Carnegie Hall in April 2009. There is at least one local in the finals. Jennifer King is a CCM grad, has played for a number of local orchestras, and is currently a flutist for the Kentucky Symphony Orchestra. Select Piccolo from the Category drop-down list. Now, there are three finalists, so the responsible thing to do is to recommend that you listed to all three and choose your favorite. But I know you are all busy people, so I can save you the time and recommend that Jennifer is the one you want to select. Also, you can vote once a day. So the old joke "vote early, vote often" is very applicable here. In contrast to the Chuck E Cheese b-day party, we were invited to a birthday party at The Toy Lab Saturday. This place was great. The workers wear lab coats and discuss making toys in an entertaing way for the kids. Then they kids go and pick out parts of broken toys, and get them assembled as new toys. The kids then name the toys and describe their special powers to everyone. The kids loved it. Yesterday was the first and hoepfully last time I go here. If our kids get invited to another birthday party here, wifey will have to take them. I took the bullet once. Anyone interested in meeting at Fountain Square skating rink early afternoon? School's out and the rink is only open one more week. The engraving showing the signing of the Declaration of Independence is low quality. Previous post in this category was the 500-million dollar bill from Zimbabwe. The wind last night was blowing stuff all over, and my son was fascinated by his discovery that the fast moving clouds made it look like the buildings were moving when you looked up at the cornice..which I agree is a cool sensation. There are a lot of things to admire about Abraham Lincoln, and you certainly don't need me to list them out for you, so I thought I would share some Lincoln tidbits on this day. First, you can check out some Lincoln photographs on Flickr. Yes, they actually had photographs during Lincoln's lifetime. 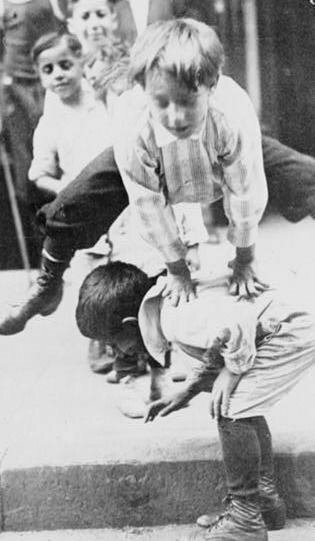 In fact, the Library of Congress has a collection of photos online, including 22 of Lincoln. Second, you can read Lincoln's writings for free. Project Gutenberg creates electronic versions of public domain books. They have quite a few writings of Lincoln available. An easier route is ManyBooks.net where they provide an easy point and click to convert Project Gutenberg (usually) texts to whatever format you want. They have a page dedicated to Lincoln's texts. If you do not have an e-reader, you can download the documents as PDFs. Third, I would like to share a quote that displays Lincoln's leadership. It is taken from the Memoirs of General William T. Sherman (link to the entire manuscript on Project Gutenberg). If you want to read that book, you can download it in various formats at ManyBooks.net as well. In the crowd I saw the officer with whom I had had the passage at reveille that morning. His face was pale, and lips compressed. I foresaw a scene, but sat on the front seat of the carriage as quiet as a lamb. This officer forced his way through the crowd to the carriage, and said: "Mr. President, I have a cause of grievance. This morning I went to speak to Colonel Sherman, and he threatened to shoot me." Mr. Lincoln, who was still standing, said, "Threatened to shoot you?" "Yes, sir, he threatened to shoot me." Mr. Lincoln looked at him, then at me, and stooping his tall, spare form toward the officer, said to him in a loud stage-whisper, easily heard for some yards around: "Well, if I were you, and he threatened to shoot, I would not trust him, for I believe he would do it." The officer turned about and disappeared, and the men laughed at him. Soon the carriage drove on, and, as we descended the hill, I explained the facts to the President, who answered, "Of course I didn't know any thing about it, but I thought you knew your own business best." I thanked him for his confidence, and assured him that what he had done would go far to enable me to maintain good discipline, and it did. I was impressed by this passage. A leader, who instills total trust in his subordinates. A leader who "squanders" an opportunity to grandstand to the crowd. 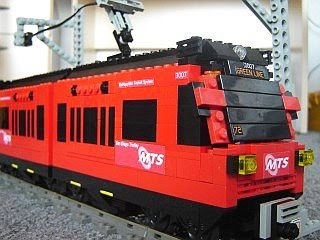 Now that our pretend city has its very own streetcar to circulate people within, they need more rail transportation to connect with other Lego neighborhoods. 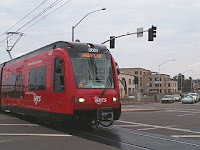 And since they don't have to worry about asking permission from voters, politicians or taxpayers, the addition of a light rail system is certain. They have, however, received several bids in response to their RFQ (Request for Quotation). Please review them below and submit your purchase recommendation, along with rationale and justification for same, in the comments. RFIs (Requests for Information) may also be submitted via comments, and will be responded to within 24 hours up until 18Feb2009. "The days where we're just building sprawl forever, those days are over." - Obama at a town hall event in Ft. Meyers, today. On C-Span, second to last question (at time 58:15), from a city councilwoman. 1:07 p.m.: Question: How can you help with infrastructure and transportation? Answer: We've got a lot of work to do. Nods to American Society of Civil Engineer's recently released 2009 Report Card for American Infrastructure, which gives the country's roads, bridges, and ports a national grade of D. Makes a case for high-speed rail and mass tranit -- says the days of sprawl are over. "Everyone recognizes that's not a good way to design communities." I was out sweeping the sidewalk Sunday afternoon, and I heard a sickening crash. I looked up, and I saw a car smashed into the side of my neighbors car. Then get this, the guy keeps on driving! Fortunately a few blocks away, the idiot ditched the car (a late model Focus) and ran. The damage was actually pretty minor, but it got me thinking again about how so many of our streets have been turned into raceways. Cars are always trying to "beat the light", and zooming as fast as possible to the next signal. Most of the streets in Over-the-Rhine would be better as either 4 way or 2-way stop intersections. Of course signals would still be needed at Boulevards and Thruways such as Liberty, Central Parkway and Reading,, maybe even Vine, but the rest would function just as well, and make a more pleasant environment if they were just old-fashioned, low-tech stop signs. Looks like this was bought over a year ago by Celine Piri, Owner of a Staffing Company. I am very intrigued by Google's street view. For those who don't know, Google sends specially outfitted cars around the country to take pictures from the street. Any street that has been captured can be viewed. This has lead to some interesting finds on Google. One site compiled the Top Ten Moments Caught on Google Maps. When they came through our street, I missed the car but could determine the day because the in-laws were in town and it caught their car on the street. So actually the #1 moment caught in the first link, was actually this staged event. If you watch the video you can see what a Google car looks like. It is nice to see a company like Google have a sense of humor about their product. Reds Opening Day is Monday, April 6th this year. Mark it on your calendar, we will have a party. Who will lead the push to have CPS cancel classes that day? I have heard that CPS has added 3 days to the calendar to make up the snow days. School will now includ Feb 13, March 31 and May 28. And I missed two great kid events yesterday because no one told me about them. SCPA had a production of Frog and Toad All Year, and Justin Roberts was in town for two performances. Something More and Less is a recent body of work by Sean Wilkinson, a Professor of Photography at the University of Dayton. 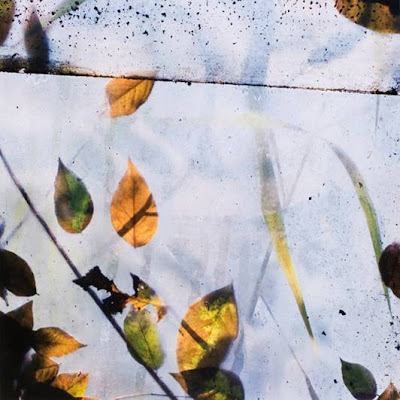 Having studied with such photographers as Minor White, Harry Calahan and Aaron Siskind, Wilkinson has forged his own style from the essential and essentially complex activity of seeing. These images-deliberately but unpredictably blurred-emphasize how elusive and conditional the act of seeing can be. What ends up as a picture is both something more and less than what was in front of the camera. ...What then is this world of the New Urbanism, and why is traditional architecture important to it? There are many reasons, but the primary one is that because traditional architecture is a common language of the American middle class... The enormous American middle class is the group that really matters, and yet they are the only consumers of architecture not addressed in the modernist schools or the professional periodicals. ...the middle, class unlike the poor, the market gives choice -- and given choice they choose traditionalism. Their ability to evade the modernist discourse (which the poor cannot do) confuses architects. But it does not confuse us. ... we enlist the middle class to our cause, which is to have them inhabit again a walkable, compact, and diverse urbanism. I learned a few things last night. First I learned more about the Weston Art Gallery. This is the gallery at the SW corner of 6th and Walnut. Half of the gallery is on the lower level out of view of the street windows, so some people may not be very aware of it. I learned that their mission is to exhibit well-recognized artists who have a Cincinnati background. The current exhibit is "Luminous Paintings by Tom Bacher". Last night Tom spoke about his work and took questions. He talked about his process and his life journey. He was blacklisted in Cincinnati in the 70's, and he left town to live in New York, though I think he now lives in downtown Cincinnati. He has an engaging personality. The exhibit is beautiful, and I would recommend taking children, as the luminosity will get their attention. - Sat Feb 14, 10am-Noon, Children ages 5-12 can meet the artist! Found a new website about removing freeways. It is a site worth reading. ...Starbucks soon will enter the value-meal race. Schultz had long belittled such a move and said that customers were willing to pay a premium for the Starbucks "experience." ...As a country we have been spending too much on the present and not enough on the future. We have been consuming rather than investing. We’re suffering from investment-deficit disorder. ... And transportation: a trip from Boston to Washington, on the fastest train in this country, takes six-and-a-half hours. A trip from Paris to Marseilles, roughly the same distance, takes three hours — a result of the French government’s commitment to infrastructure. Well you knew it had to happen sooner or later on this blog. And since there are no petition drives in the land of Lego, our pretend-city is getting a streetcar! Our old friend Akos Kostyan in Hungary built this on special request. 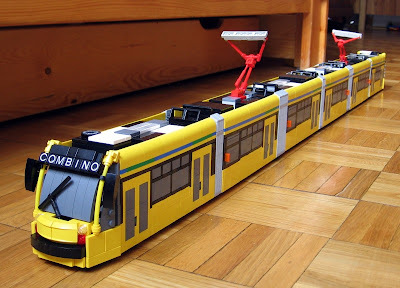 BKV, or "Budapest Transport Limited" company wanted a LEGO model of their new streetcar (which they call a "tram"). 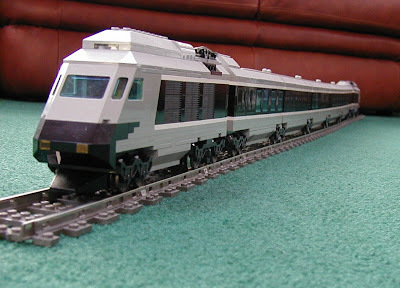 They actually approached LEGO Hungary to have one built but LH turned down the offer. 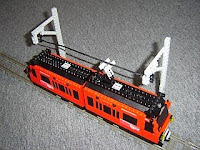 Akos told BKV it would be impossibe to model this tram in LEGO bricks but decided to give it a try. "I decided to concentrate on the shape, so I used non-transparent "windows". A lot of thinking went into the pantograph design but the biggest challenge was building the drivers cabin. 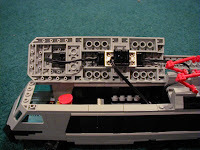 I still have to figure out a coupling system for the tram, right now the cars are not connected, so the tram can only be used as a static model. It has two 9V train motors and the cars are on wheels, so otherwise the tram could probably run on train tracks without problems." Here's the real thing he modelled it after. Excellent work Akos! Too bad he's so far across the pond, or I'd pack up my Legos and a few brewskies and stop by to play. Look down and you may see this. ..and look up and see ugly icicles! or straight ahead, a weed tree. 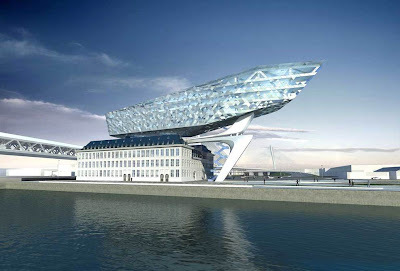 Has Zaha's ship run aground? Is iconic starchitecture in its death throes? Will it be replaced with the age of infrastructure? The age of the architectural icon—that extravagant, exuberant, "wow"-inducing building on a pedestal—is dead, or more precisely, in its death throes. And what will replace it? President Barack Obama, who once dreamed of being an architect, had something to say about that Tuesday in his inaugural address: the age of infrastructure. ...The icon age was born in 1997 with the smash opening of Frank Gehry's Guggenheim Museum in Bilbao, Spain. The titanium-clad museum, with its dazzling collage of shapes, spawned a new "build it, and they will come" mentality: Hire a star architect, or "starchitect," give him or her free aesthetic rein, and watch the tourists or the buyers arrive. ...And yet, icons divorced from infrastructure are nothing more than empty set pieces, objects divorced from the fabric of everyday life. ...the real issues transcend style. They are about whether the new infrastructure will help usher in a new set of urban growth patterns—dense neighborhoods where you can walk or bike to the corner store to buy a carton of milk—or whether new roads and bridges will simply reinforce suburban sprawl. ... Icon architecture is no longer the issue du jour. It's sustainability—and survival. See also, the End of the Bilbao Decade.